ESPN’s Pardon the Interruption averaged 832,000viewers and a 0.3 adults 18-49 rating to lead Wednesday’s cable sports programming. ESPN’s non-exclusive coverage of the St. Louis Cardinals vs the Chicago Cubs averaged 798,000 viewers and a 0.2 adults 18-49 rating. 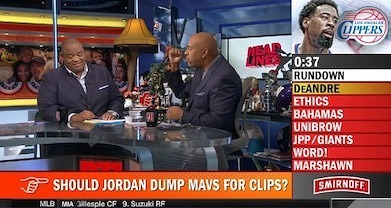 ESPN’s Around the Horn averaged 501,000 viewers and Highly Questionable averaged 434,000. On Univision Deportes Costa Rica vs Jamaica averaged 491,000 viewers and El Salvador vs Canada averaged 446,000. On the UniMás broadcast network the Costa Rica-Jamaica match averaged 1.288 million viewers and El Salvador-Canada match averaged 1.263 million, but based on the wording of yesterday’s Univision press release, it seems like the numbers for the Univision Deportes simulcast are already included in the UniMás number, so if you add them together you’ll probably be double counting. The Fox Sports 2 numbers are in the table below. On FS1 The Ultimate Fighter averaged 423,000 viewers and a 0.2 adults 18-49 rating.